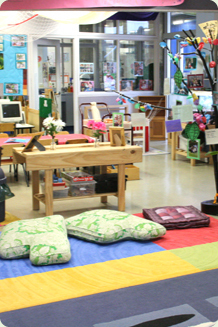 At the children‘s centre, we offer a Long Day Kindergarten Program in two classrooms. These classrooms are designed for 4 and 5 year old children the year prior to them attending school. The Kindergarten program runs between the hours of 9.00am - 3.00pm Monday to Friday over the school terms to closely reflect a school routine. Outside of the Kinder program hours and over the school holidays a play based program is offered. The kinder classrooms are fitted with beautiful wooden furnishings. The large windows provide natural light throughout the year and create a wonderful ambience and a relaxed learning setting. The Turtle room has the capacity for 22 children per day and the Dolphin room has the capacity of 20 children per day. Each classroom is spacious and is balanced with individual, small group and larger group experiences to engage in. The program in both Kinder rooms are influenced by the Reggio Emilia approach, Simon Nicholson‘s Loose Parts Theory and Howard Gardner‘s Multiple Intelligences Theory. These, in conjunction with the Victorian Early Years Learning and Development Framework create a holistic program that gives every child a chance to learn, be successful and achieve their fullest potential during their Kindergarten year. We have created a specially designed program that is exclusive to the kinder rooms which focuses on the children‘s physical health and wellness, encourages healthy eating, mindfulness and holistic health. Both rooms participate in weekly bush walks to parkland behind the centre for a nature exploring session. The children also engage in a Perceptual Motor Program (PMP) which assists children in developing gross motor, fine motor, balance, coordination and kinaesthetic development. As part of our Healthy Eating Program, the kinder programs take part in gardening activities and growing their own herbs and vegetables as we believe that children are more willing to try eating healthy food when they are involved in the process of growing them. A variety of interesting and challenging experiences are planned in the rooms as part of our investigation session. Children will find opportunities to observe, explore and experiment which helps children develop inquiring minds and a scientific approach to solving problems. Through these experiences your child will build on their knowledge, explore and express new ideas and become more independent and confident in their abilities. Families are welcome to meet with their kinder teacher at the end of each term to discuss their child‘s development and overall progress. The centre also holds a school readiness talk in the middle of the year to assist families in choosing the right school. We have a vast range of information and handouts, and our friendly Educators are happy to help with any questions.